Bay windows project outward from the wall of the home. They create a feeling of extra space inside the room and create a larger viewing area to the outdoors. Bay windows first became popular in the 1870’s. Today bay replacement windows are sometimes installed to achieve the Victorian feel of that era. Due to their versatility, Premium Vinyl Windows’ bay replacement windows are also installed for a variety of other reasons. SuperSeat™ base: Special window seat construction provides excellent R-9 insulation against the cold outside. It is available in white birch, oak, a variety of laminates, Corian®, and custom matching stains and varnish. Woodgrains: Five interior woodgrains are available so you can match your bay replacement window to your fine furniture. Comfort-Foam™ insulated: Each mullion and window frame is insulated with Comfort-Foam™ for maximum energy savings and comfort. Welded Sill Pan: This exclusive feature eliminates water penetration. In addition, the unique design provides a built-in weep system to channel rain away from the window. 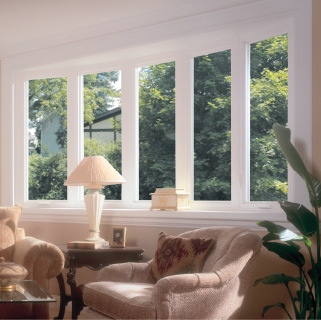 Sag-free support: Premium Vinyl Windows bay replacement windows will not sag over time. Our threaded steel rod and chain bracing system securely supports the full weight of the over-hanging window. In situations where a home’s roof comes too close to the bay window to allow use of the rod and chain system, knee brackets are installed. Style choice: Choose between casement, picture, and double-hung window styles to fill the openings of your bay replacement window. Custom roof system: Order a custom-fitted, painted aluminum or copper roof for your bay replacement window or have your factory-trained installer make a shingled roof to match the roof of your home.